My sitcomly diverse housemates and I have instituted a house meal plan. Monday it's meat and potatoes, noodles dressed in soft eggs and bacon -- from the Croatian. Tuesday the Jewish pre-med hands us a platter of pasta and ketchup and tells us it was a delicacy back in Russia. Actually, he's fond of some fish and greens and things, too. Thursdays the Indian dishes up dal and curry and rice. Wednesdays the Mennonite girl spends all morning at work handling peaches, and winds up with a let's-put-yummy-things-together-and-call-it salad. Last week it was let's-put-yummy-things-together-and-call-it avgolemono. (Oh, yes, I'm regularly employed now at a health-insurance-providing charming little market down in the Mission. I make cornucopiac cascading displays of peaches. And I get discounts at the creamery across the street). In designing a menu for my housemates, I have to consider their capacities. The Russian says, "Back in Russia starvation was a delicacy," and chows down on plateful of food like he just did an Ironman in Siberia. Not so far from the truth. His favorite hobbies are going to the gym, running, and wishing he went more places icicle-free women also went. The Indian bikes across the Golden Gate Bridge to and from work every day. Add an extra 1200 calories to both of their portions. The Croatian is slender, rather like a daisy growing on a cloud. It's encouragement to limit my plate accordingly. My meal-planning tactic so far has been to make a regular supper and supplement it with vast quantities of good bread. Place two egg yolks in a bowl. With a fork, beat in one drop of olive oil. Beat in another. And another. Now a teaspoon. Beat. Now a splash. Beat. When it is stiff and glossy, add a sprinkle of salt, a tablespoon of minced rosemary, a tablespoon minced thyme, and the juice of half a lemon. It should be almost swizzle-able -- if not, thin with lemon juice or thicken with oil. 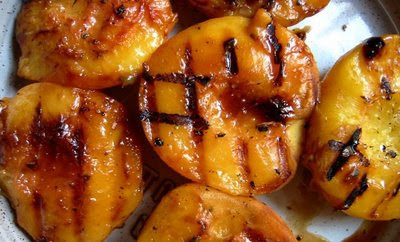 Dip whole peaches in boiling water for a minute so you can easily slip off their skins. Or peel them. Cut them in half, remove the pit, and place them on a fairly hot grill or one of those skillets with raised lines. When nicely seared, rotate them 60 degrees to make pretty cross-hatching marks. When those marks are well-formed, flip them and repeat. Cover for a bit, then lift them carefully and leave somewhere they can cool. 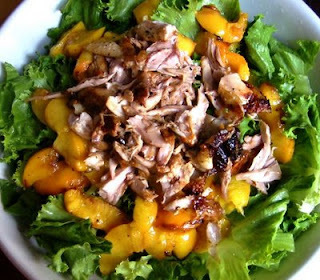 Arrange chunks of cooled grilled chicken legs, sliced grilled peaches, and soaked sunflower seeds or tomatoes or avocado or cheese, all on a pile of rinsed and dried lettuce. Serve with rosemary-thyme aioli.